The contributions in this volume pay homage to Zenon BaÅ„kowski, with a focus on problems concerning law’s normalization and the revitalizing force of anxiety. Ranging from political critique to methodological issues and from the role of human rights in development to the role of parables and analogy in legal reasoning, the contributions themselves are testament to the richness of BaÅ„kowski’s scholarship, as well as to the applicability of his core ideas to a wide range of issues. Divided into five parts, the book focuses on the role and methods of the jurist; conceptions of legality and the experience of living under rules; jurisprudential issues affecting exchange and the market; and the burden and methods of legal judgement. It also includes BaÅ„kowski’s 2011 valedictory lecture and a bibliography of his work. Comprising all original contributions, the contributors represent a balance of established, leading figures and younger, emerging scholars in the field of legal and social theory. Contents: Introduction, Maksymilian Del Mar and Claudio Michelon; Part 1 The Jurist at Work: The jurist’s conscience: reflections around Radbruch, Roger Cotterrell; Citizenship and social class revisited: liberal reason, sociology and public places, John Holmwood; Thinking in images in legal theory, Maksymilian Del Mar; History in the service of life: law’s authority and dealing with the past, Adam Czarnota. Part 2 Legality: But to live inside the law, you must be honest, Claudio Michelon; Living under dead ideas: law as the will of the people, Fernando Atria; Iconoclasm revisited: Zenon Bankowski, law, love and Antigone, Emilios Christodoulidis; Fulfilling the law by breaking it? Formalism within legality, Francisco Saffie. Part 3 Exchange: The ethical character of market institutions, Russell Keat; The law of contract and the limits of the welfare state, David Campbell; What’s love got to do with development?, Oche Onazi. Part 4 Judgement: Analogy and parable in legal reasoning, John Bell; ’Holding the middle’, or, 'dancing on the edge…'?, James MacLean; A logical journey: the anxiety of Lesniewski quantifiers, Burkhard Schafer. Part 5 Looking Back/Looking Forward: The long goodbye: a… life in and out of the law, Zenon BaÅ„kowski; Afterword, Neil Walker; Bibliography of the works of Zenon BaÅ„kowski; Index. 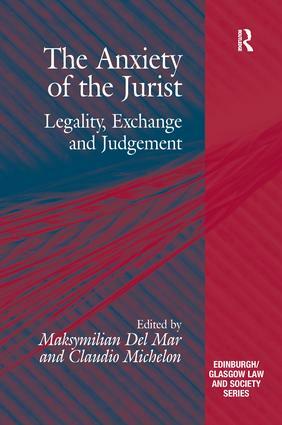 Maksymilian Del Mar is Reader in Legal Theory, Department of Law, Queen Mary University of London. Claudio Michelon is Senior Lecturer in Law and Legal Theory at the School of Law, University of Edinburgh. The Critical Studies in Jurisprudence Series provides a forum for interdisciplinary study in the philosophical, political and sociological traditions of thinking about the law. It is these linkages and intersections that the series sets out to chart and explore, in the tradition of research undertaken in the Law Schools of Edinburgh and Glasgow for over twenty years. The series covers a broad field that includes legal reasoning and the ethics of rule following, public law and democratic theory, socio-legal studies and the sociology of punishment, crime, crime control and policing, the politics of transitional justice, as well as the sociology and anthropology of law. The Series places special emphasis on the function of law in its political dimension and with it, in the uses of critical legal theory, capturing something significant of the orientation and the priorities that animate research and teaching in both Law schools.